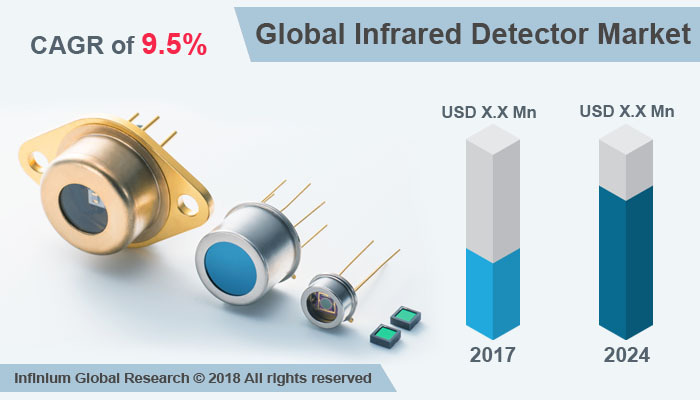 A recent report published by Infinium Global Research on infrared detector market provides in-depth analysis of segments and sub-segments in the global as well as regional infrared detector market. The study also highlights the impact of drivers, restraints, and macro indicators on the global and regional infrared detector market over the short term as well as long term. The report is a comprehensive presentation of trends, forecast and dollar values of global infrared detector market. According to the report, the global infrared detector market is projected to grow at a CAGR of 9.5% over the forecast period of 2018-2024. The infrared detector is a sensor that detects or measure infrared radiation. Infrared detector converts infrared radiation into a measurable form. These detectors play a major role in consumer electronics devices such as a smartphone, smart TV and many others. Additionally, infrared detectors are used in night-vision applications, security, monitoring processes with temperature variation, aerospace applications, medical applications, identifying ecological disasters, and more. Due to its compact size and ability to detect infrared light from far distances, these are highly used in various application. Photodetectors and thermal detectors are the two types of infrared detector. Infrared detectors are manufactured from Mercury cadmium telluride (MCT), Indium antimonide, Indium arsenide, and Lead selenide. The growing use of infrared detector in consumer electronics and increasing demand for security at commercial environments hospitals, airports, hotels, and offices are the major factors that boost the demand of infrared detector market. Additionally, growing application of infrared detector in automotive, medical, scientific, military and industrial area is also escalating growth of the infrared detector market. Moreover, low price of infrared detectors and the development of IR detectors in terms of size, weight, and power are some supporting factors fuelling the demand the for the infrared detector mareket. On the other hand, the high cost of mercury cadmium telluride (MCT) and Indium gallium arsenide (InGaAs) technologies and government regulation pose a restrain to the growth of infrared detector market. Going further, technological advancement in infrared detector technology and increasing awareness of IR detectors among manufacturing and industrial applications is projected to provide potential opportunities for the Infrared detector market in near future. Among the geographies, Asia Pacific is anticipated to hold the highest share for the infrared detector followed by North America. It is expected to grow with the highest CAGR during the forecast period. The increasing demand for infrared detector from military and defense and industrial application is boosting the growth of infrared detector market in Asia Pacific region. The rising geo-political tensions in some of the Asia Pacific countries create additional growth opportunities for the infrared detectors in this region. Furthermore, the presence of a large number of manufacturers in the region especially in Japan contributes to the growth of the infrared detectors market. Moreover, the presence of leading manufactures such as Texas Instruments Inc., Excelitas Technologies Corp, and Omron Corporation in the U.S region escalates the demand of infrared detector in the North America region. The report on global infrared detector market covers segments such as wavelength, type, and application. On the basis of wavelength, the sub-markets include short-wave infrared, medium-wave infrared, and long-wavelength infrared. On the basis of type, the sub-markets include a thermal detector and photo detector. On the basis of application, the sub-markets include aerospace & defense, automotive, industrial, medical, consumer electronics, security, and others. The report provides profiles of the companies in the market such as Texas Instruments Incorporated, Hamamatsu Photonics K.K, OMRON Corporation, Honeywell International Inc., Excelitas Technologies Corp., Raytheon Company, Nippon Avionics Co., Ltd., Sofradir Group, InfraTec GmbH, and FLIR Systems, Inc. The report provides deep insights into the demand forecasts, market trends, and micro and macro indicators. In addition, this report provides insights into the factors that are driving and restraining the growth in this market. Moreover, The IGR-Growth Matrix analysis given in the report brings an insight into the investment areas that existing or new market players can consider. The report provides insights into the market using analytical tools such as Porter's five forces analysis and DRO analysis of infrared detector market. Moreover, the study highlights current market trends and provides forecast from 2018-2024. We also have highlighted future trends in the market that will affect the demand during the forecast period. Moreover, the competitive analysis given in each regional market brings an insight into the market share of the leading players.